Situated in the Royal Borough of Kingston upon Thames, Coombe is a small south London area characterised by fabulous period properties. Sharing borders with the river Thames and Richmond Park has led to this being a highly desirable place to live. Below are a few fascinating facts about the river Thames. The Thames flows 215 miles through 9 counties from Gloucestershire to Essex and is the longest of the rivers solely in England. From its source at Thames Head to the Thames Estuary near London, the river meanders through 16 large towns and cities. From the Thames Estuary to Teddington Lock the river is tidal with the difference in height between tides measuring as much as 23 feet. Heading west from Teddington there are 44 more locks to be navigated before finally reaching Thames Head. There is 4,994 square miles of land, called the Thames River Basin or the Thames Catchment, which naturally drains into the Thames. In addition there are a further 18 major river catchments, 38 main tributaries and numerous small watercourses that add to the flow of the river. At various locations along the Thames between Oxfordshire and Kent a number of islands can be found. Known as either Aits or Eyots, these are mainly formed where streams divide or by sedimentation. Although there are 190 islands only around a quarter of them are inhabited. 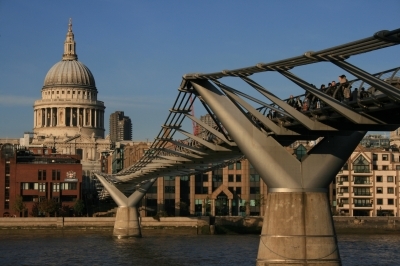 Crossing the river Thames are more than 214 bridges and 17 tunnels. The majority of these are for road traffic but some are designed to accommodate trains or allow pedestrians or livestock to cross. Although bridges date back many hundreds of years the oldest tunnel was opened in 1843. The ports of London play an important role in the capital's history and the shipping industry still dominates the tidal section of the Thames with about 60 shipping companies located here. Some of the docks, wharves and wharves that had fallen into decline have been developed to provide housing, retail and leisure facilities. The annual university Boat Race between Oxford and Cambridge draws huge crowds and helps to promote water sports. Sailing, kayaking and pleasure cruising remain popular but with in excess of 200 clubs dedicated to rowing, this is the most popular sport on the Thames. Maintaining the natural environment throughout the Thames River Basin is essential and there are 46 Sites of Special Interest and internationally designated Special Protected Areas dedicated to conservation. It is possible to see voles and otters along some stretches of the Thames and seals are frequently seen in the Thames Estuary. Dolphins and porpoises are regular visitors to the Thames, particularly during the summer months, and a 2012 fish survey found short-snouted seahorses living in the river. The Thames is the source of the main ingredient of the Traditional London dish of Jellied Eels but more than 125 different fish species also live there. In addition, more than 350 varieties of benthic invertebrates (backboneless organisms) are known to occupy the river.